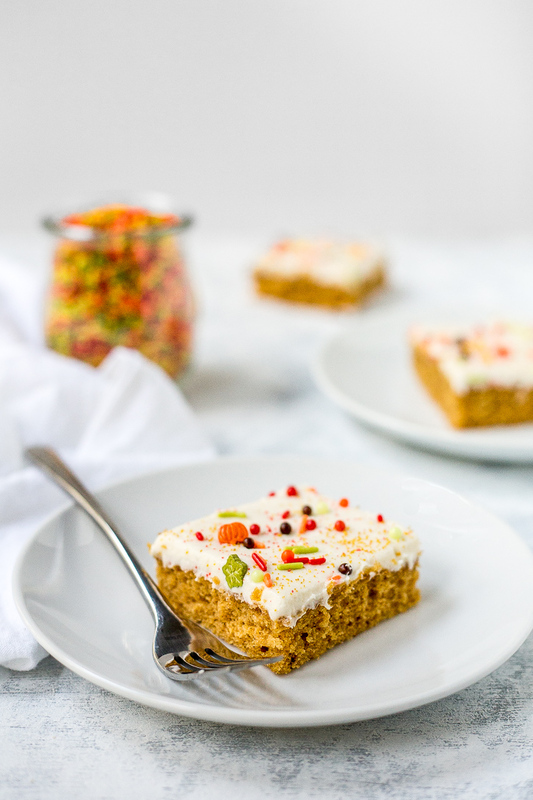 This moist sweet potato sheet cake is topped with a layer of rich cream cheese frosting and is perfect for feeding a crowd! For a baking enthusiast, there’s nothing quite like fall weather and the promise of the upcoming holidays. I don’t know about you, but as soon as November rolls around, I immediately start planning dessert for Thanksgiving dinner and Friendsgiving celebrations. This year, I’m excited to partner with Wilton to bring you some baking inspiration for your fall holiday gatherings! Enter this sweet potato sheet cake. This recipe is totally no-fuss, easy to transport and perfect for feeding a crowd! I love my layer cakes, but this was actually a really nice break from all the labor they require. The cake itself is moist and the combination of cinnamon, nutmeg, ginger, and cloves gives it a cozy fall spice. Paired with a rich cream cheese frosting, it becomes a pretty irresistible dessert! To keep the process simple, I chose to use canned sweet potato puree, which is similar to canned pumpkin. Just make sure to look for plain sweet potato puree at the store, not sweet potato pie filling. However, if you prefer, you can check out the notes on this sweet potato layer cake recipe for instructions on how to make your own sweet potato puree at home. With big holiday gatherings in mind for this recipe, I wanted to bake this cake in a large sheet pan. Wilton’s Ceramic Cookie Pan, which measures 11.75″ x 17.25″ was perfect for the job. Not only is it a beautiful piece of bakeware, I also love the easy-cut guides around the edge of the pan. You’ll get perfect slices every time! If you make this sweet potato sheet cake, don’t forget to share it on Instagram and tag @flourcoveredapron. I love seeing what you bake! Preheat oven to 350 degrees Fahrenheit and prepare an 11.5 x 17.25 sheet pan (or jelly roll pan) by lining the bottom with parchment paper and lightly spraying the edges with nonstick baking spray. In a medium-size bowl, whisk together the dry ingredients (flour, baking powder, baking soda, salt, cloves, nutmeg, cinnamon, and ginger). In a large bowl and using an electric mixer, cream together the butter and both sugars for 3-4 minutes. Add eggs one at a time, beating to incorporate after each addition and scraping down the sides as necessary. Then, add the vanilla extract and sweet potato puree, mixing to combine. Gradually add the dry ingredients, mixing on low speed after each addition until just incorporated. Use a spatula to spread the batter evenly in the prepared sheet pan, then bake at 350 degrees for 20 - 24 minutes, or until a toothpick inserted into the center of the cake comes out with just a few moist crumbs attached. Place sheet pan on a wire cooling rack and let the cake cool completely before frosting. Using an electric mixer, beat together the cream cheese and butter on medium-high speed until smooth. With the mixer on low speed, mix in the powdered sugar one cup at a time, scraping down the sides as necessary, until completely incorporated. Add a pinch of salt, vanilla extract, and heavy cream, then mix until smooth. If needed, add more cream or powdered sugar until the desired consistency is reached. Use an offset spatula to spread the frosting evenly on top of the cake. Decorate as desired with sprinkles. Leftover cake can be kept covered in the refrigerator for about 3 days. Thanks Nicolas! It was fun to do something festive for fall.